Lets read few more experiences of devotees with Lord Shirdi Sai Baba. Anonymous Devotee from India says: Thanks Hetal Ji, for this selfless and divine endeavor you have undertaken, which helps new devotees like me to strengthen their faith and practice patience. It makes me feel more hopeful and stronger every time I read the experiences. Please do not disclose my name/email address, let me be anonymous. I was not big devotee and trusty of Baba 4 years back. But now, I feel that I am alive because of Him. At the time of recession 2008, I lost my software job and surrounded by lot of family problems. At that time, I started reading Sai Baba book, but not with full belief on Him. My friend told me if we keep our feet on Dwarakamai, then our old sins will be vanished. So I alone went to Shirdi. One Thursday, Baba came in my dream. Dream was: I was reading Sai Baba book and Baba gave His blessings. Later, I got job. But that was not permanent. If I clear internal exams and interviews, then only my job will be permanent. I was worried much. Again Baba came in my dreams and told: “Don’t worry, I am there”. My job became permanent. I got married. I have given birth to baby boy and my son’s name is Sai. Immediate after my delivery, I got back pain and consulted doctor and she replied that it’s common for software engineers. After 2 months, back pain became worst so consulted doctor again. Doctor told I need to undergo a spinal operation and that too next day only. If I delayed coming to hospital for 2-3 days, then I would have lost my legs (paralysis). My operation went success. After 2 months of my operation, I joined back to office. I am living happily with my family. Baba gave new life to me. Before I eat anything I just close my eyes once and think of Baba and then start eating. This is the way I show my prayer to Him. Baba, You have changed my thinking and life. Sai Brother Razu Ji from UK says: I am a normal devotee of Shirdi Sai. I thought to share my experience every time I visit on this blog. But due to my laziness, I always skip writing. Today I finally I got the time to share my experience. It's been three years I am in UK. Till now each and every time I was in trouble, Shirdi Sai helped me. He was with me, when it was time for my master’s results and visa extension. Without His blessings, I would not be here today. My father always suggests me to write a letter, when I was in need. Whenever I get a problem, I write a letter and I leave in front of Sai Baba's feet. By surprise, I get rid of those problems and hurdles by Baba's grace. It’s not just with me. I recommended my friend to do that. Do write the letter heart fully, not for namesake. Whatever is the problem Shirdi Sai will definitely help you. 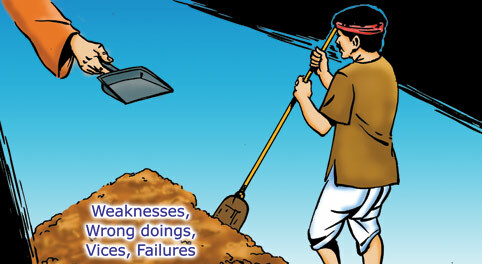 In these three years, there are several instances, where Sai Baba helped me. Friends, I request you to write a letter with your problems heart fully and Baba will definitely help you. Anonymous Devotee from USA says: Thanks for giving me the opportunity to write here. I am staying in USA from last 4 years. Baba came in my life from last Jan, 2011. Please don’t disclose my email or name. I don’t know from where to start. Since childhood, I believed in Maa Durga a lot. I always treated her as my Mother. I used to keep so many Fast for her. After my B. Tech., I fell in love with a guy and we were in relationship. But after 1 year, he left me saying he can’t tell his parents about me due cast system. I took this as MAA decision and move forward with my life. In 2007, I came to USA and then in 2009. One of my friend, she introduced me to a boy and I was in relation with him. When time came, he said the same thing that he can’t tell his parents and he left. I prayed a lot to MAA and that time BABA came in life in 2011. I prayed Him that made this happened. I left my job in USA and went back to India as that guy was in India. I went to see him. But the strange part, suddenly his company sent him to USA. I was in India that time. I stayed there for 5 months praying Baba that please help me and give that boy courage. But he never came back in my life. Somehow, the company I was working called me back to USA. And in July 2011, I was in USA again. Now I thought no more relationship and will wait for my parents to arrange a boy for me. But my fate decided something else. There is boy working with me and he was good friend of mine. He approached me again again and again. As he knew everything about my past, he was very caring. I asked Sai that now this is the only direction I am seeing. Guide me. Should I go in this direction? I also asked Sai, The guy who will have Your photo, I will take that as Your sign. I was surprised to see the guy in my office had photo of Sai in his purse. I was so sure that he is the one. Then I asked Sai for another sign. Near our place, we have a SAI temple where Sai Abhishek happens every month. I asked Sai to call me with him to see Your Abhishek. That will be the biggest sign for me that You are approving for this relation. To my surprise, I went to see SAI Abhishek with him, which was not possible under the circumstances. Now, this boy also said the same thing that he can’t tell his parents due to caste and other family issues. He stopped seeing me and said we are just friends. I don’t know what I should do now. Is this Right Sai? I am going with the same pain again and again. Please Sai devotees, pray for me that I should get justice and Sai, You only gave me the signs that he is the one and now You only taking him away. Please help me. After reading your experience I am pained at your fate. But at the same time I advice you to read Sri Sai Satcharitra daily so that you will be mentally stablled and follow the right path of your career instead of being ditched by unfaithful guys.I also advice you to marry the guy of your parents choice.I pray BABA to give you strength to choose an appropriate person selected by your parents. Sai is our father,mother and every thing for us.I only thing is we all should have shradha&saburi. Thanks for postings the experiences. Baba i need your blessings for sai naam jaap. Thanks for sharing all ur experiences. @Anonymous devotee3: Please be patient and pray to Sai, he will never let you down. Leave all ur burdens to him. He will take care. Dont worry friend Just surrender to lotus feet of Sai and follow HIs words.' " Donot swim only float" whatever situation it is. Baba will take care of you. baba....i fail to understand why your devotees are put to such severe and dirty situations in life and people who dont care for others get success and are at a strong and powerful situation...is this wat people should get in return of being pious and spiritual? I really pray to you from the bottom of my heart to help the devotee in the third experience find love in life and settle her with grace than making her go through such humiliating incidences. I only wonder when we come in your fold how can other people still have to power to do injustice with us or behave so cheap with us. This question alwaz bothers me a lot and would really appreciate if someone on this blog can throw some light on it. Thank you for the nice experiences! Devotee from India, Baba gave you good advice through dreams and it is good that before every meal you pray to him. Razu Ji, thank you for telling Baba devotees about writing a letter to Baba, and I will also try it. Devotee from USA, don't worry, Baba will tell you which guy is the right one for you. I too was worried about finding a good bride, but Baba arranged everything at the correct time. You should also do 9 Thursdays Vrat and see the wonderful results that will come. Om Sai Ram! PLEASE HAVE MERCY ON 3RD DEVOTEE..ALTHOUGH WE HAVE TO SUFFER OUR KARMA'S..OUR SHOULDERS ARE INCAPABLE OF DEALING WITH SEVERE PAIN...ONLY YOU CAN BORE OUR BURDEN...REQUEST TO 3RD DEVOTEE...PLEASE LEAVE EVERYTHING ON SAI BABA...HAVE FAITH IN BABA...NOW LET BABA CAME IN FRONT AND DO WHATEVER HE WISH TO.. I know how it feels to get hope and find out it was false. It's makes you feel so confused and bad. I guess Baba is making you go through your past karmas before giving the fruit. My mom's cousin had to go through the same thing and somebody suggested her to do the Santoshi Maa Vrat as it is especially done by women for marraige problems or if you want kids. She strictly followed the 16 weeks fast and pooja and really, she got the marraige proposal at her door on the last Friday of her fast. You said you're a Durga maa devotee along with Sai's devotee. You can do it if you want to or you can wait. Please don't get stuck in the pain as it's not healthy for you. My heart goes out to you. I know how you feel as my daughter has also had many disappointments for the last many years, She is now depressed but I know Baba has plans for her. In the same way Baba will send the right person for you. I will include you in my prayers. Have faith. Baba Please help your devotees and please be with us always. Lots of Prema to all SAI Devotees…. Is it true that people who are pious and spiritual are suffering and bad people are always enjoying life to the full extent? No. The reason we perceive it like this as we are very shortsighted- we cannot judge our karma beyond this life. Where SAI DEVA is omnipresent, who is ever present in each of our lives. Pious people like Bhisama was on the ‘BED OF ARROWS’ due to his past karamas, Dhritrashtra did not have eye sight, due to his past karamas, Dhritrashtra lost 100 sons due to certain past karams. Even both were so pious to go upto their past 100 lives, but they were unable to go beyond past 100 lives. In past 100 lives they did not do any Bad KARAMA. When they both asked KRISHANA the reason for their suffering, KRISHNA had to take them to their past lives beyond 100 births, to realise them what they did. GOD is very merciful, very kind, loving. We are at fault for our sufferings. Other thing- when we turn towards or TRUE SELF/SAI, our past karma start burning at fast pace, so that we can get moksha sooner than later. Moksha is attained when we do not have any bad or good karma to bear for…..
Lots of THANKS to BABA For EVERYTHING. LUV & PEACE TO ALL…. It's good that u want to take babajis blessings before u try to make a commitment. I know that u are disappointed. I have read your experience as a third person and I am.just trying to give u some possible explanation. Again I might not be accurate, but it is what I see as a outside person. I am also a devotee of babaji and trust in his signs very much. Sometimes when we understand some signs and signals, we do not see some things which an outside person can see. We are sometimes clouded with our own imaginations. These things happen with everyone and I.am just trying to explain what I feel. After reading my explanations, please think about it. For the first sign, you prayed to babaji that u want to see babajis picture near the guy, babaji chose for you. You did see the picture near the guy you were interested in. But Saibabaji is prayed and respected almost by everyone. Last year, shirdi itself received donations almost next to Lord Babaji in tirupathi. It would be very common for Indians to have babaji pictures in their purses. That would not mean that all the persons u meet with babaji pictures would be a prospective alliance. But it was good of you to ask for a.second sign. I cannot really have any explanation here. You have prayed for it as a sign and it happened. I do not know the full story behind it of how you both ended up going together. But there is one thing I can see here. After, you thought and prayed to babaji, did u ask ur friend to go to the temple with him or did things just happen and fell into the place that u both ended up going together. For the second experience it would be very much a sign if things fell into place after u prayed to babaji that u and ur friend should go to temple together without u asking ur friend directly. That means that nature itself has taken effort to make ur wish come true. But, after u prayed to babaji for a sign, and if u asked him and u both went to the temple together, u cannot really consider that as a sign from babaji. You might question that something could have happened and u both could not end up Going together. But he himself being a devotee of babaji, would not say no if offered a chance to go to the temple. Babaji luvs his devotees very very much. He would never ever give u false hopes abt Anything. Rethink about the signs u got and think if they were really signs . A sign given by babaji himself will be unquestionable. It will.be a very strong sign which u cannot just ignore. Also, looking at the recent guy u were interested in. Why would u want to get married to the guy who can leave u for silly reasons like caste. You are in the hands of babaji and u have asked.babajis permission before u went for this guy. That means that u have given up ur own will and prayed to babaji for guidance to accept this guy or.not. There will be very few devotees like u who ask babaji permission before accepting a relation. All of us generally, fall in Luv and ask babaji to give us that person no matter what. But u have been different here and babaji would Luv u very much for that. BABA please keep showering your blessings on us. Nice experiences. Anonymous devotee dont loose your hopes & faith as well. Baba definitely help you. I want to say u one thing that completely surrender your life in Baba's lotus feet. baba knows what is good for us 7 He difinitely give u that. Don't forget two miraculous keywords SHRADHA & SABURI. Dear, dnt worry, Sai Baba is there with you to protect you and one day, he will solve all your difficulties and doubts in your life so plz have some patience.Dnt forget to seek his mercy.Sometimes, we only see what we want to and ignore those things which Baba wants us to see.HAve Shradha And Saburi, dnt loose faith on Sai Baba ji only becoz of such guys. These type of guys dnt deserve u at all.If he is really made for u, then let him come back with his own wish. My Friend had the same issues as the 3rd devotee...She is smart,Beautiful and an IT engineer. Guys wud come to her, propose her and then leave her saying different crap reasons and she was left crying in all cases. She always wanted a committed relationship for marriage but never got that thing. It happened with her for 6 or 7 times. I wanted to help her in that situation. After careful thought we understood and concluded that we have to get rid of our past karmas and untill they are burnt we get pain. She said she might have been a boy in her past lives ditching different girls and might be suffering because of all this. She understood that and prayed to kali maa a lot. Everyday she wud ask pardon from Kali maa to forgive her for previous wrong karmas if there are any. And believe me people...she finally married to a very nice guy ( who also happened to be Divorced) and living a hppy life now. She even agreed to marry this guy even though he was divorced as he did not tell her initially that he is divorced or not. And when she started liking him he revealed the truth about himself. See again it is her past karma that she had to marry a divorced guy but sheis leading a happy life now after all struggles. Sometimes we cant change destiny and accept things and pray. Dont lose hope and I wish n pray that you get a nice alliance soon. Have firm faith in baba and do SatCharitra Parayan regularly. Baba life ka har pal aapke charno mein arpit hai. Aap mere saare kasht jaante hein. Solution de deejiye. Om sai ram. Sahi decision lene mein help keejiye. Baba i thought many things positive and to succeed in life. But everything going in different path baba. I feel why i'm alive and making others sad in life. please bless me baba you are the only way left in my life i'm so scared baba. please baba fill happiness in my life and my loved one life.